Often called the gateway game of European board games, Settlers of Catan, is also the pioneer of European board games. Wired Magazine does a great job explaining the phenomena back in 2009 with an article titled "Monopoly Killer: Perfect German Board Game Redefines Genre. To get an idea of how influential Klaus Teuber, creator of Settlers of Catan, read the exerpt below. Its a great indication of how popular these board games are in Germany. ...In 1991, Klaus Teuber was well on his way to becoming one of the planet's hottest board game designers. Teuber (pronounced "TOY-burr"), a dental technician living with his wife and three kids in a white row house in Rossdorf, Germany, had created a game a few years earlier called Barbarossa and the Riddlemaster, a sort of ur-Cranium in which players mold figures out of modeling clay while their opponents try to guess what the sculptures represent. The game was a hit, and in 1988 it won the Spiel des Jahres prize—German board gaming's highest honor. Because of this enthusiasm, board game design has become high art—and big business—in Germany. Any game aficionado will tell you that the best-designed titles in the world come from this country. In fact, the phrase German-style game is now shorthand for a breed of tight, well-designed games that resemble Monopoly the way a Porsche 911 resembles a Chevy Cobalt. Eventually, Teuber whittled his invention down to a standard pair of dice, a handful of colored wooden houses that represented settlements and cities, stacks of cards that stood for resources (brick, wool, wheat, and others), and 19 hexagonal cardboard tiles that were arranged on a table to form the island. He had hit on something with this combination—the enthusiasm on family game night was palpable. During nearly every session, he, his wife, and their children would find themselves in heated competition. The game was done, Teuber decided. 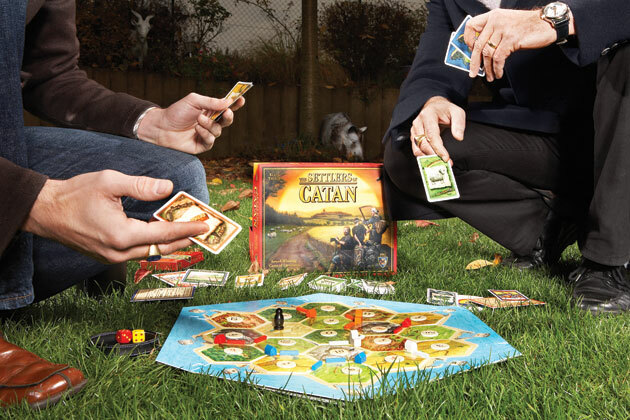 He called it Die Siedler von Catan, German for "The Settlers of Catan...."
Find out what happens next at WIRED Magaizine's webs site. Dont Forget. If you want European board games in Portland visit us at Off The Charts Games!